It has been a special joy for our family to have my friend Nobuko S. staying with us this weekend. I have written about our special friendship in a previous post two months ago…she was my English student when she was in high school and came to know Jesus during that time. It has been so neat to see how God has matured her and made her even more beautiful! In addition to gifts of worship leading and translation, Nobuko has a special gift of prayer, particularly in the prophetic realm. God gives her pictures and meaning to go with those images that she shares for the purposes of encouraging people to be who God is calling them to be. Yesterday morning at our time of worship she shared her testimony and how dramatically God has changed her life. I asked her then to pray over the teen girls in our group. As she shared and prayed over them, we were all moved to tears – she had never met them before but her images and words of encouragement that she sensed from the Lord so fit these young friends and what they needed to hear. The leaders of our group then decided not to have our normal Word time, but instead to allow Nobuko to minister to all of us. It was an amazing and touching time in which the Holy Spirit worked in some amazing ways. There was not a dry eye. One of the things that stands out from that time was her encouragement and prophecies for Eric. She said she sees Eric like a jumbo jet – with a huge heart to care for people, whom God will use to shepherd and bring many to himself. I loved that so much. 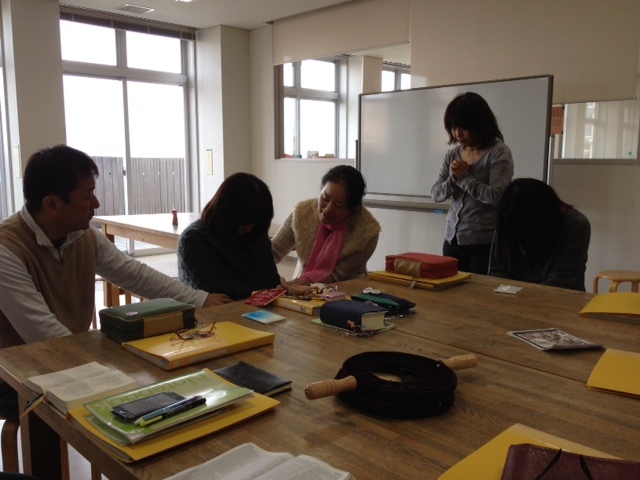 Another friend with gifts of prophecy and prayer last month felt that God is going to use Eric to father the fatherless in Ishinomaki. I feel thankful to be married to him, and thankful for the ways that God desires to use us as a couple. Later in the afternoon, we gathered the kids around Nobuko and she shared and prayed over each one of them. Eric was not there at the time, but at bedtime they each shared vividly what Nobuko had shared with them. They were inspired to grow more towards Jesus — the eagle with special eyes to see where God is at work; the bear who will be a warrior for injustices; the ice skater who God is using as f riend-raiser; the lion in the jungle, whose creativity and courage will be used by God. As Eric and I talked with her late into the night, we became increasingly aware of how important these gifts of encouragement are to Japanese people, especially. There is such an emphasis in this culture on enduring, or pressing on and trying to be strong. We see it with tsunami victims, we see it with business men and women, moms in our neighborhood, and teachers at our children’s school. Everyone has to put on the right face and toughen up. But so many people are tired. In our morning worship session, I could see new hope come over the face of one of the men in the group who has been struggling with family issues. And another mom who was so encouraged by Nobuko’s words of hope in the midst of her challenges. Hope arose around the table. What a special gift God gave us! We are hoping to have Nobuko come back in a month or so and do a seminar for our friends that she has written on hearing from God. I love how the shy high school girl who I prayed with to accept Jesus twenty years ago is now so tremendously speaking into my life and my family’s hearts, and reminding us of how God wants to continue to redeem and bring hope to this culture in rich and unexpected ways. Wow, what a wonderful weekend you had, and what a blessing Nobuko is! It must be so neat to see how God uses this young woman who you helped lead to Christ!